7 Kids and Us: Beaches Arrives on DVD May 9th! I probably saw the original Beaches movie a thousand times. I was in love with everything about it, the songs, the friendship, even the sad moments. I was devastated when I knew I wouldn't be able to see the new movie because I don't have cable (thank you Hulu and Netflix!) So, when I heard it was going to be on DVD soon, I was super happy. 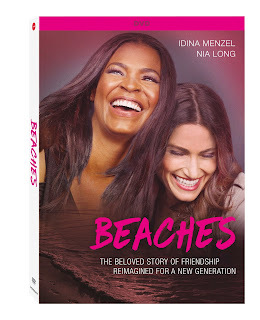 Relive the powerful story of lifelong friendship in an all-new remake of the classic movie when Beaches arrives on DVD at Walmart on May 9 from Lionsgate. Tony Award® winner Idina Menzel and NAACP Image Award Winner Nia Long star as two very different women who share an unexpected friendship that, even with its ups and downs, lasts for decades. This new version of the 1988 film includes performances by Menzel of iconic songs from the original movie such as “Wind Beneath My Wings” and “The Glory of Love,” in addition to Menzel’s new original song, “Last Time.” The Beaches DVD will be available at Walmart for the suggested retail price of $14.98. In this contemporary remake, Beaches follows the serendipitous meeting of two young girls on the Venice Beach Boardwalk, who, though worlds apart in lifestyle, embark on an unexpected and lifelong friendship. CC (Idina Menzel) is an aspiring singer trying to make it in Los Angeles when she is discovered by a director who gives her her first big shot. Hillary (Nia Long), the daughter of a prominent civil rights lawyer, struggles to find her own destiny. Their friendship — even with its ups and downs — sustains them for decades. Gabriella Pizzolo, Grace Capeless, Jodi Capeless, Sanai Victoria, and Antonio Cupo costar.